Plate 44 (drawing the curtain) of Owen Jones’s Scenes from The Winter’s Tale, mid-19th century. Spoiler alert: something magical happens in the last scene of Shakespeare’s The Winter’s Tale. If you haven’t read or seen it—maybe you’re waiting for Folger Theatre’s upcoming production, which begins March 13—stop reading now. We don’t want to ruin it for you. Sarah Siddons as Hermione. Adam Buck, 1802. Harvard Theatre Collection. Catalogue of dramatic portraits, ART File S568 no.52 (size XS). If you’re familiar with The Winter’s Tale, you know that in the first part of the play, Leontes, king of Sicilia, is hosting his friend Polixenes, king of Bohemia. Suddenly, Leontes becomes unreasonably convinced that his wife, Hermione, has committed adultery with Polixenes. Leontes calls for Polixenes to be killed, but he escapes. Hermione, under arrest, gives birth to a daughter; Leontes orders the baby to be taken overseas and abandoned. 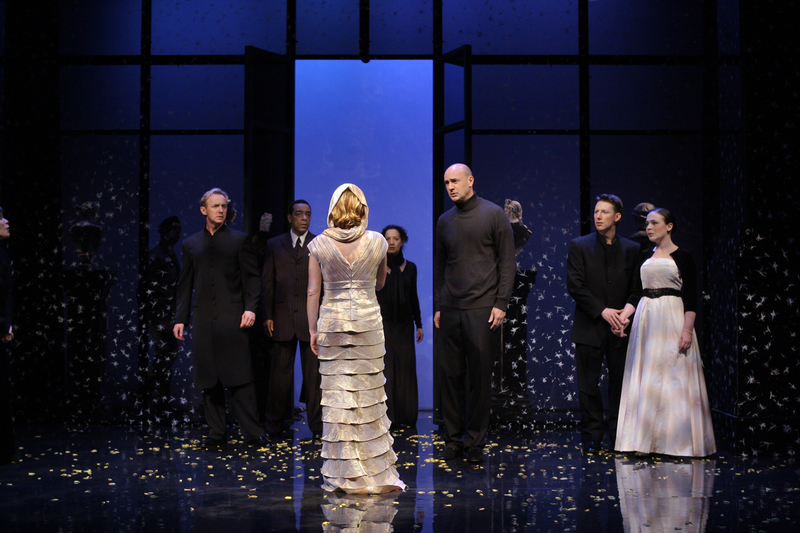 The death of the couple’s young son, Mamillius, brings Leontes to his senses. But it is too late. Word arrives that Hermione, too, has died. In Bohemia, a shepherd finds and adopts the baby girl, Perdita. The final scene takes place sixteen years later. Perdita, miraculously, has returned to Sicilia, and Leontes is reunited with the daughter he never knew. The play’s greatest miracle, though, is yet to come: a statue of Hermione, who has been dead for sixteen years, magically comes to life. ’Tis time. Descend. Be stone no more. Approach. I’ll fill your grave up. Stir, nay, come away. Dear life redeems you.—You perceive she stirs. You kill her double. Nay, present your hand. Hermione’s resurrection leaves us with more questions than answers. Because of the scene’s head-spinning ambiguity, directors, actors, illustrators, and readers are free to dream up their own stagings of the scene, all of which might say something new and different about the possibilities of forgiveness and redemption. We dug into the Folger’s collection and found a handful of images of the statue scene in The Winter’s Tale—prints, photographs, drawings, and more. On Monday, March 12, check out our Instagram and Twitter profiles as we share some of our favorites. 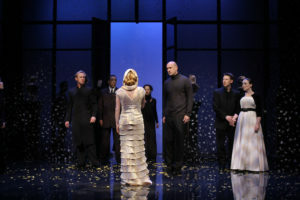 Have you ever seen or worked on a production of The Winter’s Tale with its own take on the statue scene? 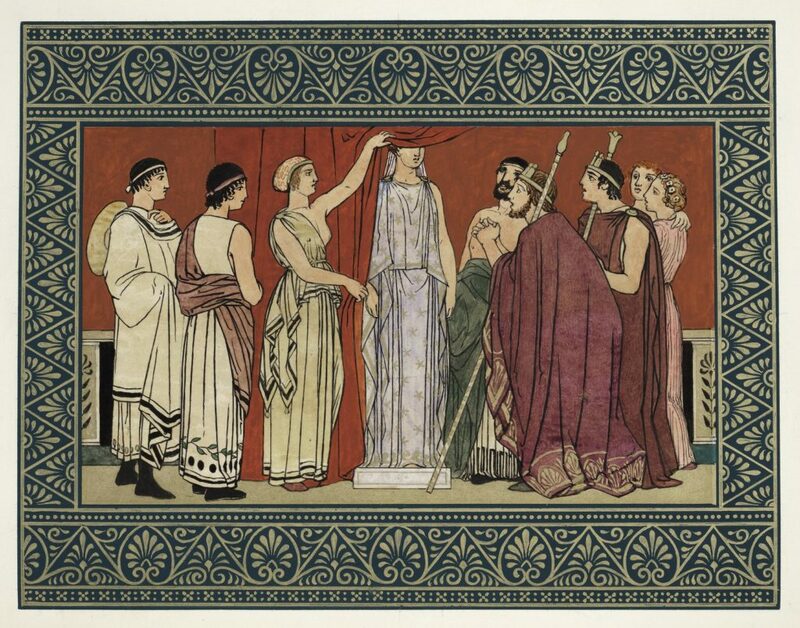 Do you own an illustrated edition of the play? What do you think happened to Hermione? Share your favorite stagings of the famous scene, or of other key moments in The Winter’s Tale, with the hashtag #ImaginingShakespeare. 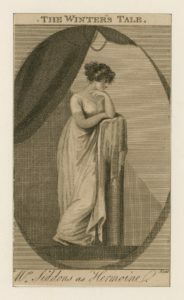 An engraving of “Mrs. Hartley in the character of Hermione in Shakespeare’s “The Winter’s Tale.” 1780 ART File H332 no.1 (size XS). Illustration of the statue scene in Shakespeare’s “The Winter’s Tale,” by Charles Taylor, published December 1786. PR2883 T27 Cage. An engraved illustration of “The Winter’s Tale” by Frank Howard, 1832. ART File S528w1 no.75 part 13 (size XS). A pen and ink drawing by Byam Shaw of the statue scene from Shakespeare’s “The Winter’s Tale,” 1900. ART Box S534 no.37 part 8 (size S). Photograph of a 1904 Byron Company production of “The Winters Tale,” starring Viola Allen as Hermione. ART File A431 no.51 (size M). Pen and ink drawing of Hermione’s descent from her pedestal by Louis Rhead, not after 1918. ART Box R469 no.71 (size S). Ben Lauer is the Folger's Social Media and Communications Manager. Have you ever liked one of the Folger's posts on Instagram or followed us on Facebook? If you have, he told us to tell you that he really appreciates it.